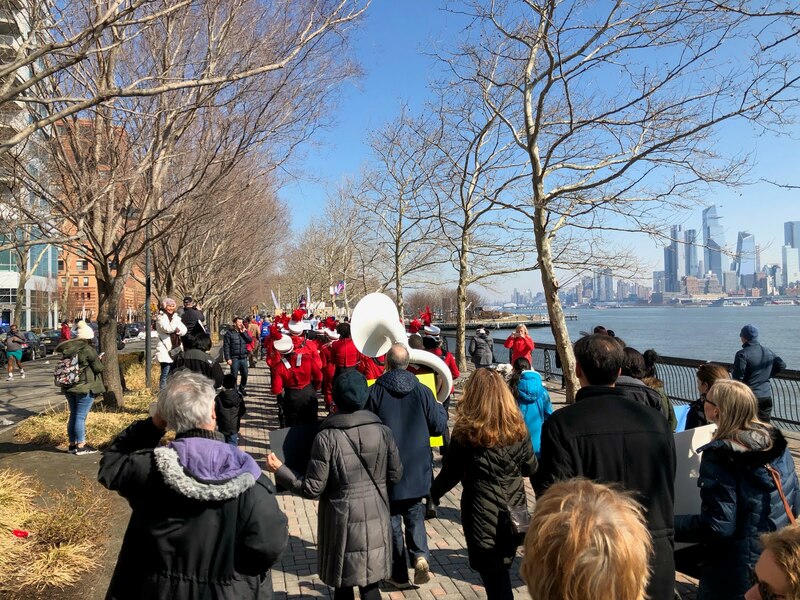 Several hundred Hoboken residents participated in a peaceful march to Maxwell Place from Pier A against NY Waterway operations at the Union Dry Dock site. Many in Hoboken want to see the Union Dry Dock location added as additional park space. The ship repairs at Union Dry Dock are Hoboken's last vestige to its on the waterfront industrial past. The Hoboken High School Band was summoned to join the march to Maxwell Place. While NY Waterway has been denied permits to operate as a refueling station serving thousands of its customers who take ferries to Manhattan, there's been no alternative amenable to NJ Transit and NJ Governor Phil Murphy to remove NY Waterway and its proposed operations at the Union Dry Dock location. NJ Transit holds eminent domain control over Union Dry Dock superseding similar powers and initial action by the Hoboken City Council tabled last year. The Hoboken eminent domain process ruffled feathers in Trenton. Reportedly, the public clash over Union Dry Dock unleashed by Mayor Ravi Bhalla was not well-received in the NJ governor's office. Hoboken City Hall is pushing for NY Waterway operations to be moved to a site at the downtown train terminal and funded an engineering report pushing the location. 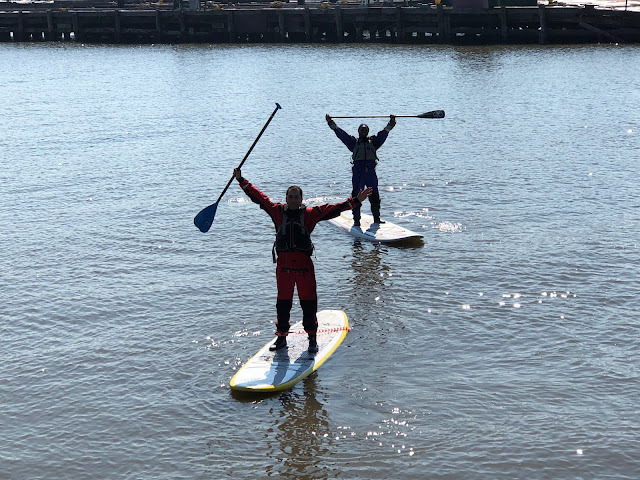 NJ Transit, the power behind NY Waterway operations at Union Dry Dock deems it less than viable economically and continues a push for a major development in downtown Hoboken. How big are you willing to go for NJ Transit towers and development again? Mayor Ravi Bhalla will announce another backroom deal when it's ready? 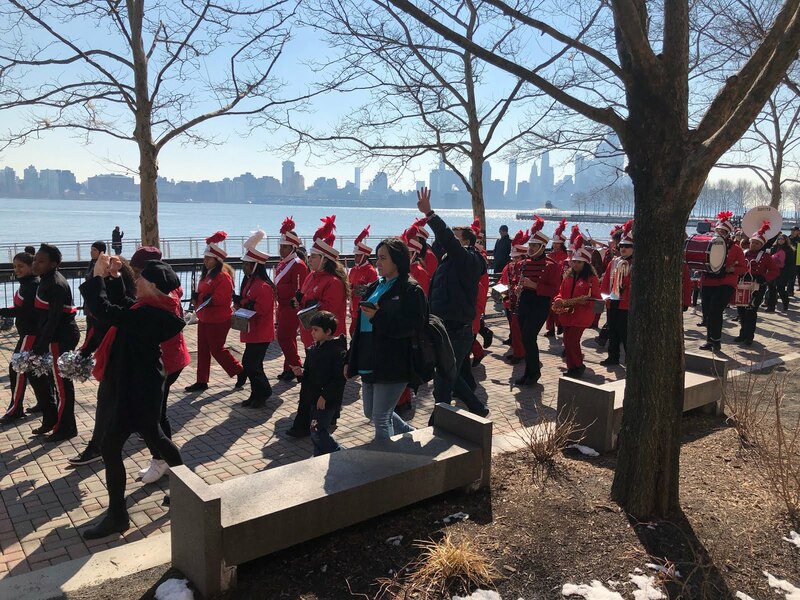 NY Waterway wants to complete its move for repair and refueling operations from Weehawken and said it needed Hoboken's Union Dry Dock location as there's no economically feasible alternative. A condo development connected to the NY Waterway owners is reportedly going up at that location. Approximately two-hundred people gathered in Maxwell Park but heard no solution to see NY Waterway ousted. NY Waterway put up its flag several months ago but has not begun operations. Permits have not been issued and reportedly negotiations are continuing. Governor Phil Murphy and NJ Transit have not announced any alternative plan to NY Waterway operating at the Union Dry Dock location to date. How high would you like NJ Transit towers in downtown Hoboken again? Another non-astroturf sign on behalf of uptown Hoboken fish. In the interim, NY Waterway and its employees are firmly in possession of the Union Dry Dock site. What is that saying about possession being what part of the law? The analogy is not accurate but symbolic. NY Waterway wants to start using the site for ferry refueling and maintenance. 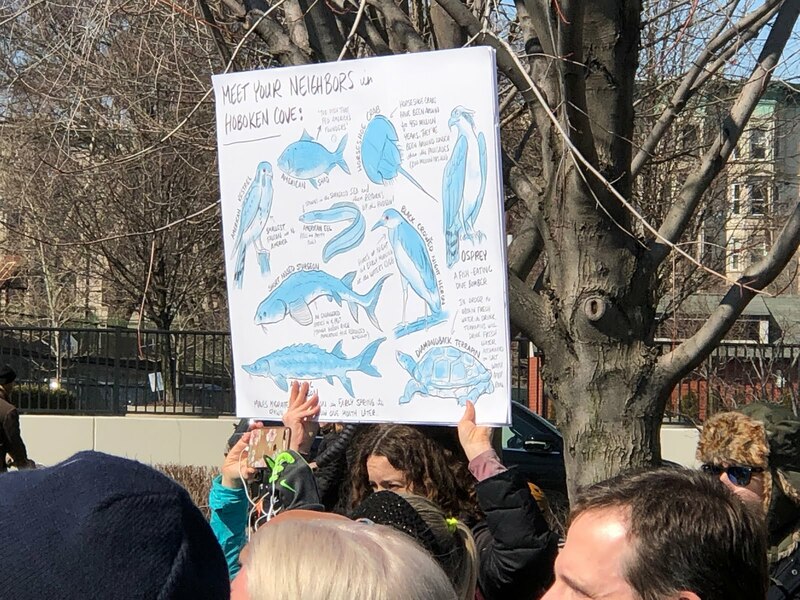 Weekend kayak enthusiasts raise their arms in support of the march. Among those in attendance, Mayor Ravi Bhalla, Assemblywoman Annette Chaparro, City Council President Jen Giattino, council members Tiffanie Fisher and Mike DeFusco who were later joined by Councilman Jim Doyle. The tenor from the Hoboken mayor's office changed from confrontation last year to "gratitude." Mayor Ravi Bhalla said, "... the governor.... has gone above and beyond the call of duty to make sure that he stands with Hoboken.... 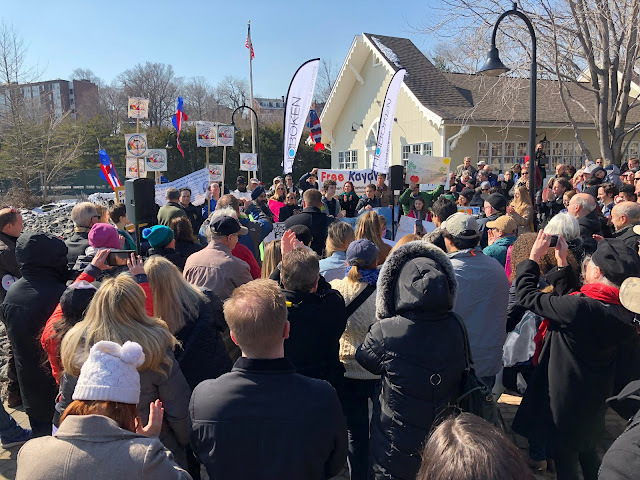 I know Governor Murphy will have our back in this battle, believe me." 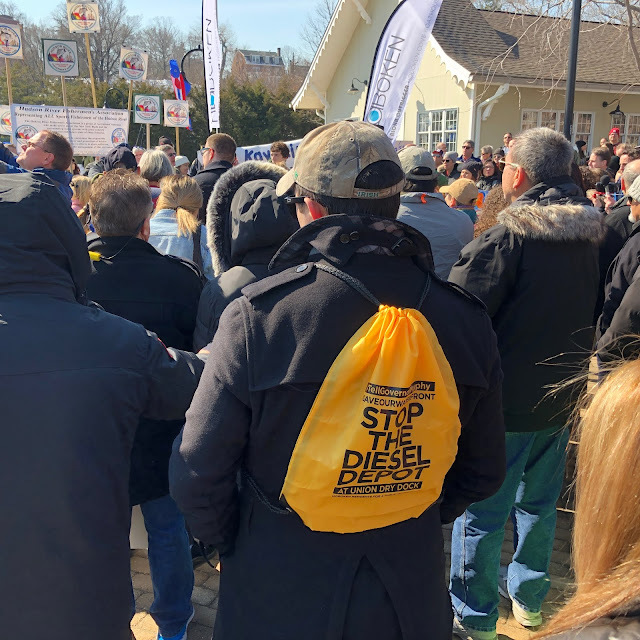 One man sported a bag saying, "Stop the Diesel Depot at Union Dry Dock." 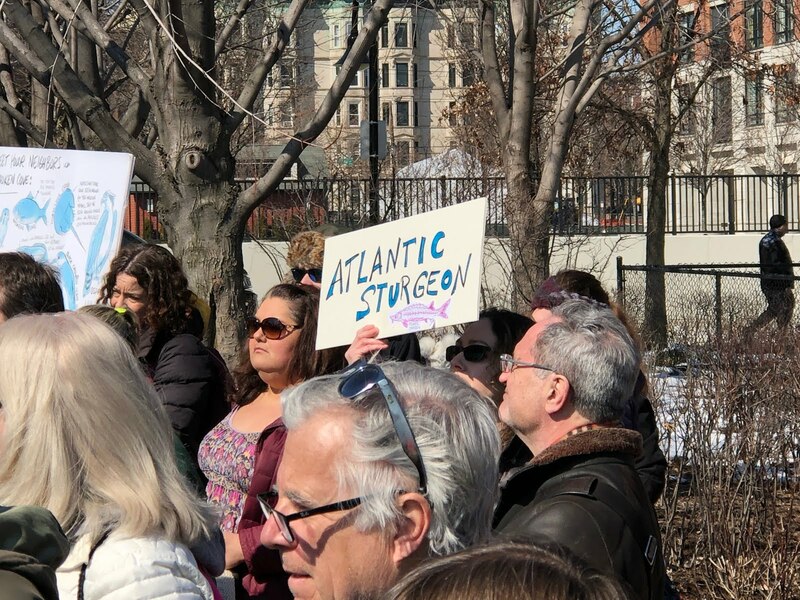 For the moment, there's nothing anticipated to resolve the current situation in Hoboken's favor and reverse NY Waterway operations at the Union Dry Dock site. 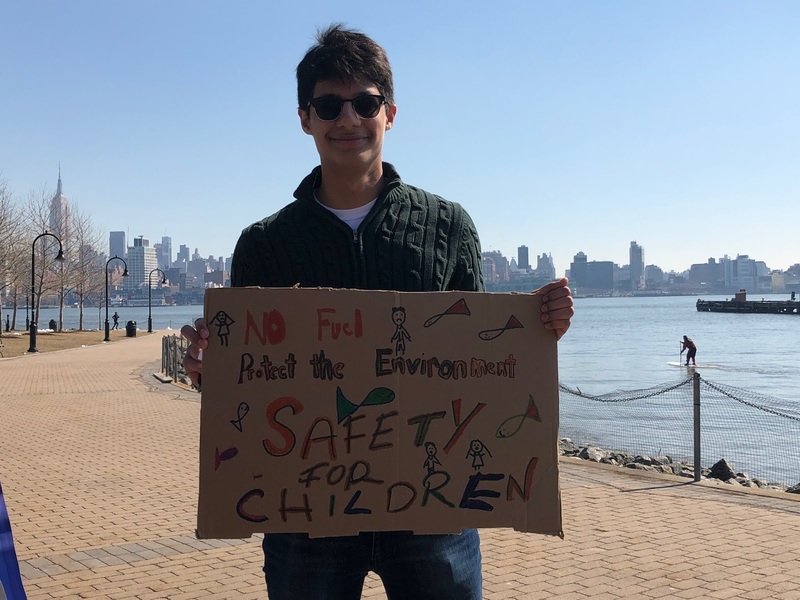 Hudson County View reported Ravi Bhalla saying he's not aware of any forthcoming decision, "I really can't speak to that one way or another." Another man offers an organic weed preference. However, New Jersey has not finalized any plans to legalize marijuana. Mayor Ravi Bhalla offered another idea in the hopes of changing the course of NY Waterways' plans at Union Dry Dock. “There is a possibility of decoupling the uses. For example, having a refueling facility at one location and a maintenance repair facility at another location. So we’re looking at all possibilities, but we definitely know for sure that there are other possibilities other than Union Dry Dock,” Bhalla said. 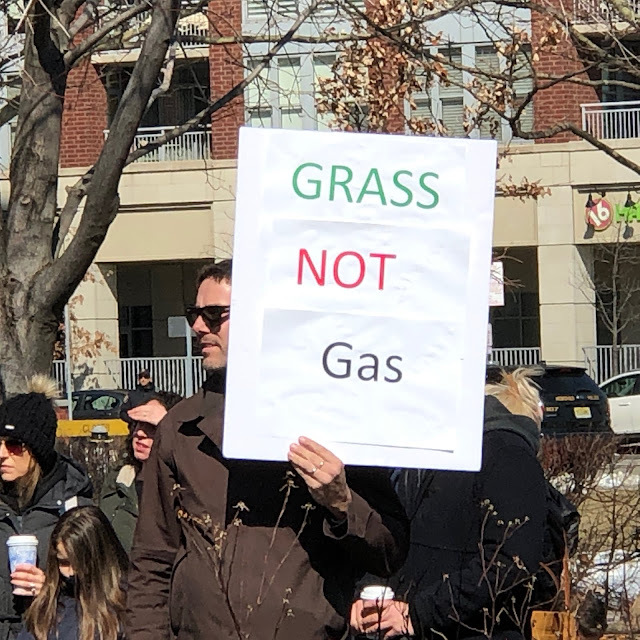 In the interim, many in Hoboken hope for a better resolution than the current situation. One man adds his homemade sign to the proceedings. Several groups publicized the event including Hoboken Residents for a Better Waterfront and Fund for a Better Waterfront.